When women complain to doctors about symptoms like sleep disruption or hot flashes, they’re often told it’s just a “normal” part of aging. But who wants to be “normal?” Physicians have no problem prescribing medicines to relieve pain, regulate menstruation or lower cholesterol, but often dismiss the tools we have to treat the signs of aging—treatment that could greatly improve a patient’s quality of life. Addressing the problems that come with aging means addressing women’s—and men’s—hormonal changes. As we age, the organs that manufacture our hormones become less efficient and sometimes even stop manufacturing hormones altogether. In women, this is called menopause, when the ovaries stop producing hormones including estrogen, progesterone and testosterone. For men, this may be referred to as “Andropause” or “Low-T.” Throw into that mix the thyroid gland, which plays an important role in aging and hormonal balance. The decline in hormones can lead to problems including decreased libido, sleep disruption, decreased mental acuity, mood instability and, for women, hot flashes and bone loss. Restoring these hormones can help relieve these symptoms. Unfortunately, many people are reluctant to do so because of concerns about safety—concerns that, when you look at the medical literature, may be unwarranted for many people. 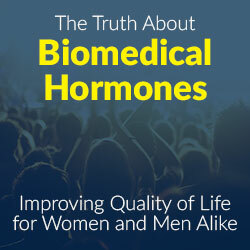 The only data we have assessing the benefits and risks of hormone replacement come from a study that looked only at manufactured, not “natural” or “bio-identical” hormones, and failed to include men. Additionally, the only points of the study widely reported were the negative ones, leaving even many doctors to believe that hormone replacement is a bad idea. But if you look closely at the facts of the study, you’ll find that that’s not usually the case. The study in question was the Women’s Health Initiative, which followed a group of women over several years. The women in the study took various combinations of premarin (estrogen obtained from pregnant mares’ urine, hence the name) and methosyprogesterone (a synthetic form of the hormone that does not resemble the progesterone manufactured by the human body). Reports on the study linked hormone replacement with an increased risk of breast cancer, colon cancer, prostate cancer, osteoporosis, dementia and heart disease. While these factors are ones people should consider before embarking on hormone replacement therapy, people also need to dig deeper to see what populations are at risk for these outcomes as well as what benefits hormone replacement therapy can offer. Women who were diagnosed with breast cancer while on hormone replacement therapy lived longer than those who were hormone free. Women on hormone replacement therapy had a lower incidence of osteoporosis and colon cancer. Women who had uncontrolled diabetes, high blood pressure, heart disease and were 10 years postmenopausal had an increased risk of heart attack or stroke when taking oral estrogen. On the flip side, though, women who had no such preexisting conditions actually had a decreased risk of heart attack and stroke. While hormone replacement therapy can greatly improve a patient’s quality of life, it is not for everyone. In my practice, we examine all potential risk factors both for and against taking hormones. We also look at the form of hormone(s) that a patient should take (oral, sublingual, topically applied, or injected) and then come up with an individualized combination of “bio-identical” hormones. These are hormones synthesized from natural sources to resemble what the human body actually produces. For patients who are not a good candidate for therapy, we look at other ways we can help. This may include recommending micronutrient testing or other wellness care to assess any nutritional deficiencies that may be contributing to their symptoms. We would then suggest a combination or supplements and herbal medicine that can improve their quality of life. For people struggling with the “normal” process of aging, hormone replacement therapy can greatly improve their quality of life. The first step is to meet with a knowledgeable physician who can help patients—women and men alike—sort through whether it is the right step for them. Did you know that roughly 25% of adult Americans have high blood pressure according to the National Heart, Lung and Blood Institute? You’re always cautioned about it in terms of poor eating habits, a lack of exercise, stress and salt consumption; which all heighten your risk of heart attack, kidney disease, heart disease, arteriosclerosis, and stroke. But there’s another very important aspect that should be included in your prevention toolbox. Stress Reduction. Let’s face it ~ learning to relax is good for you! What affect does stress have on your blood pressure? It triggers your body’s natural “fight or flight” response. Your brain releases adrenaline and your cortisol levels rise. This combination causes your blood to thicken and heart to pump faster, putting a strain on weakened arteries. Deep Breathing is easy to do and extremely effective for turning the volume down on stress. It directly helps you to counter the “fight or flight” response by slowing your heart rate. Just like professional athletes and others who are able to tune out pressure and stress, you can tap into that same skill set and reduce your everyday stress triggers. You can call on it in a second ~ use it at home or in your work place. Most of us suffer from a lack of oxygen. Only 22% of the air you breathe is actually oxygen. Our modern world environment with depleted oxygen levels in the atmosphere actually requires your cells to use even more of this odorless/colorless gas to deal with the many stresses on our body’s ability to function optimally. Whether from improper breathing, air pollution, poor diets or lack of exercise, your cells are being deprived of this essential element and consequently weakening your immune system. But, here’s the thing. That Oxygen not only sustains your life but, it also destroys harmful bacteria in your body without affecting the beneficial bacteria that you need. There isn’t an antibiotic or drug that can make that claim. This vital oxygen is another important reason why engaging in regular breathing exercises can help lower your blood pressure to healthier levels. There was research published in the 2008 edition of the ‘Nepal Medical College Journal’ which showed that a specific yogic breathing exercise pranayama (or alternate nose breathing), helped to lower pulse rate, diastolic blood pressure as well as, respiratory rate for 36 volunteers. How can is it done? To do this exercise, you simply first use your index finger to cover your right nostril. Now breathe in as deeply as possible through your left nostril. Then switch your finger to close your left nostril and now exhale the breath through your right nostril. Pause for 2 seconds at the bottom of each, and then restart by inhaling through your right nostril while still blocking your left. Once you inhale, switch your finger placement and repeat this process. Their experiment followed a four-week program and the study had volunteers perform this breathing exercise on an empty stomach, for 15 minutes each morning. The simple practice of deep breathing stimulates your parasympathetic nervous system (PNS), responsible for activities that happen when your body is at rest. Research has shown that breathing exercises like this can have an immediate effect by altering the pH of your blood, as well as changing blood pressure. But here’s another important aspect. Breathing exercises can be the key used as a method to re-train your body’s reaction to stressful situations and dampen the production of stress hormones that do such damage. ~ Fast, Simple, Free! Fifteen minutes a day can save your life. So why not make Deep Breathing a part of your daily routine? Almost 80 million Americans suffer from hypertension, which translates into 1 out of every 3 adults. These statistics are alarming, especially as an Integrative Medicine physician, I know that most cases of high blood pressure are preventable and reversible. So why do so many people have high blood pressure and what can we do about this? The principle reason behind most cases of hypertension is diet and lack of activity. What you eat truly makes you who you become. 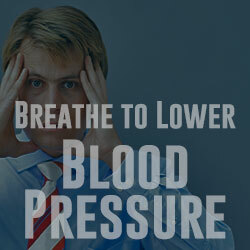 There is also an emotional component that manifests through stress which in turn can raise blood pressure. Traditional medical care focuses on prescription drugs to treat the symptoms. So, in this case it is pretty easy to write a prescription for a medicine that can successfully lower your blood pressure. Within minutes, you have your solution. Unfortunately, this is simply a cover up to the root of the problem and quite often with many side effects. I see patients who are frustrated with taking prescription medications every day and want to see a doctor who can truly help them find out the real cause of the problem and fix it from the foundation. The philosophy behind Integrative Medicine is to treat the patient as a whole (body, mind and soul) while combining the best of traditional care with natural and holistic treatments to fully restore optimum health in the patient. A thorough analysis of the diet is essential and typically a low salt diet is indicated in patients diagnosed with high blood pressure. When we eat out, we simply don’t know how much salt they put in our food. So I advise my patients to prepare their own meals, whenever possible. I cannot emphasize enough the importance of daily physical activity. Lack of exercise can lead to weight gain, which in turn can lead to many medical problems, including hypertension. So get off the couch and get moving. If you don’t have access to a gym, then go outside and walk. If you are too busy during the day, then wake up 30 minutes earlier. There is simply no excuse for not exercising. In my private practice at Whole Health & Soul, in Santa Monica, CA, I focus on spiritual wellness in relation to medical conditions. So on top of modifying my patients’ diets and planning exercise regimens, I teach my patients tools that they can do on their own, which will help them lower their blood pressure. 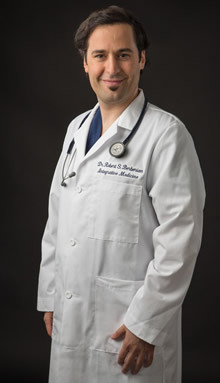 I have had many patients reverse their condition and successfully get off of their medications. It takes a serious commitment and a lifestyle change to restore optimum health, but it can be done. I provide my patients with guided meditation sessions. Many studies have shown that people who practice meditation can lower their blood pressure by about 20 mmHg. Meditation allows the mind to calm down and enter a state of consciousness, to allow healing to take place. Sitting in silence restores the connection between our mind, body and soul. Guiding my patients through a breath-focused meditation allows the calming of the nervous system which in turn lowers blood pressure. The nervous system is composed of two pathways: sympathetic and parasympathetic. Maintaining a fine balance between the two pathways is essential. In my practice, I use Heart Rate Variability Biofeedback to help treat hypertension. The fluctuation of your heart rate represents the interaction between your sympathetic and parasympathetic nervous systems. By training your breathing pattern through stress-reduction Biofeedback, you can lower your blood pressure in a short period of time. Hypertension, in most cases, is reversible. Find a doctor who will be your partner in your journey into health and most importantly, don’t forget to breathe! Double board certified in Family Medicine and Integrative Medicine with a specialty focus in Spiritual Wellness.